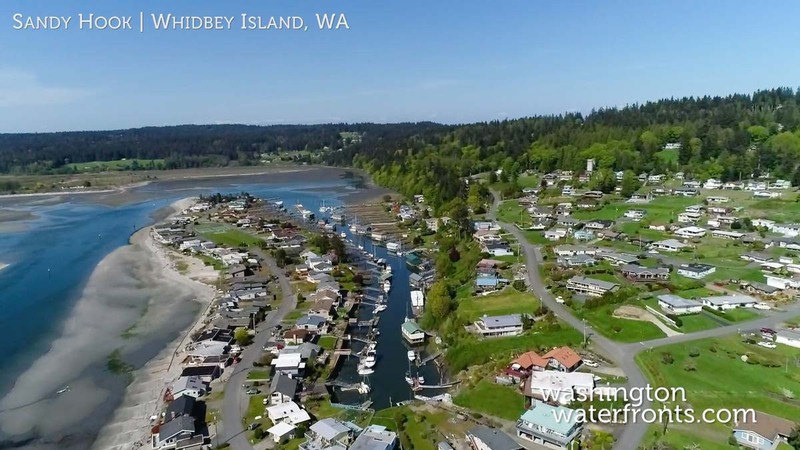 Sandy Hook is a community that lies at the southern tip of Whidbey Island on Cultus Bay, opposite of the Possession neighborhood. The town of Clinton, and the Clinton/Mukilteo ferry, is just is just a 10-minute drive northeast, making this a great area for those looking to enjoy island living and an easy commute to the mainland whether for a vacation retreat or a year-round residence. Sandy Hook also maintains a yacht club, the Sandy Hook Yacht Club Estates, which provides multiple amenities for residents, including a marina with a boat ramp, permanent moorage and a guest dock; a beach area, pool and cabana, firepit, tennis courts, and a basketball court. While members pay fees to help maintain the infrastructure of this beloved community, most of the work is done voluntarily by community members. When you have Sandy Hook waterfront real estate, you can look forward to enjoying relaxation surrounded by spectacular scenery right from home, as well as participating in a variety of recreational activities to take advantage of it all. Enjoy kayaking while catching glimpses of the wealth of wildlife, from birds like bald eagles and blue herons to porpoise and whales. Just minutes away in Clinton, you’ll find several eateries, wineries, breweries and distilleries to enjoy, along with a host of community events from Easter egg hunts to the Clinton Winter Market. If you’re into art, head to Langley just a few minutes further north and enjoy the First Saturday Art Walks. With Sandy Hook waterfront real estate, your dream of a waterfront home and island living is not only possible, it’s probably better than you ever imagined. You may be able take in those stunning sunsets over the dramatic Olympic Mountain Range and watch the ships and myriad of other vessels go by, from inside and out, along your own private stretch of beach or expansive deck. Take advantage of our industry-leading tools to make your property search as easy as possible and be sure to register for a FREE account so that you can receive email alerts whenever new Sandy Hook real estate for sale hits the market. If you’re seeking to sell your Sandy Hook property, contact our Waterfront Specialists directly for a comprehensive listing analysis and to learn more about the cutting-edge marketing strategies we’ll use to sell your home quickly for top dollar!